n the Prose Draft of 1865, Wagner described Kundry as living an unending life of constantly alternating rebirths. Sometimes she awakes in the domain of the Grail, to serve the community of Knights; at other times, she is summoned to life by the sorcerer, Klingsor. It is significant that Wagner describes her as wearing a girdle of snakeskins; since the shedding of the snake's skin is a metaphor for rebirth. Yes, one under a curse she might be. Here she lives today — perhaps reborn, to expiate sin committed in an earlier life, unforgiven there and then. Now she makes atonement with such deeds, as benefit our knightly order; she has done good, beyond all doubt, served us — and in doing so, helped herself. 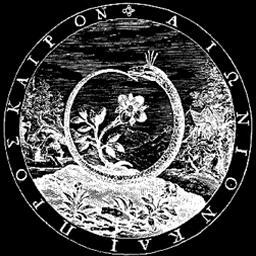 The wonderful ability of the serpent to slough its skin and so renew its youth has earned for it throughout the world the characteristic of the master of the mystery of rebirth — of which the moon, waxing and waning, sloughing its shadow and again waxing, is the celestial sign. The moon is the lord and measure of the life- creating rhythm of the womb, and therewith of time, through which beings come and go; lord of the mystery of birth and equally of death — which two, in sum, are aspects of one state of being. The moon is the lord of tides and of the dew that falls at night to refresh the verdure on which cattle graze. But the serpent, too, is a lord of waters. Dwelling in the earth, among the roots of trees, frequenting springs, marshes, and water courses, it glides with a motion of waves; or it ascends like a liana into branches, there to hang like some fruit of death. The phallic suggestion is immediate, and, as swallower, the female organ also is suggested; so that a dual image is rendered, which works implicitly on the sentiments. Likewise a dual association of fire and water attaches to the lightning of its strike, the forked darting of its active tongue, and the lethal burning of its poison. When imagined as biting its tail, as mythological uroboros, it suggests the waters that in all archaic cosmologies surround — as well as lie beneath and permeate — the floating circular island Earth. 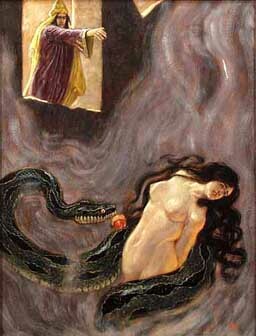 Below: Klingsor conjures Kundry, shown with the serpent of the Garden of Eden in a painting by Franz Stassen. What is the significance of Kundry's kiss?' - That, my belovèd, is a terrible secret! You know, of course, the serpent of Paradise and its tempting promise: eritis sicut Deus, scientes bonum et malum [Genesis 3:5, 'Ye shall be as gods, knowing good and evil']. Adam and Eve became 'knowing'. They became 'conscious of sin'. The human race had to atone for that consciousness by suffering shame and misery until redeemed by Christ, who took upon himself the sin of mankind. n a recent article, Katherine Syer ( Musical Quarterly, vol.94 no.3, 2011, pp 325-80 ) has made a strong case for seeing in Kundry an echo of the Serpent Woman of Gozzi's La Donna Serpente. This is the fable upon which Wagner based the libretto of his early opera, Die Feen. In this opera, prince Arindal falls in love with the fairy princess, Ada, who in some ways resembles the title character of Die Frau ohne Schatten. Arindal follows Ada through a river into the fairy realm where they live together for seven years until -- in a reversal of the story of Lohengrin -- Arindal asks his wife her name, a forbidden question that throws him back into the mortal world. Syer notes how on 3rd June 1878, as recorded by Cosima, Wagner referred to the serpentine motive of love's desire that accompanies Kundry's kiss (in our Leitmotif guide, no.10 called Klingsor's Magic). Syer notes that at the heart of this Zaubermotiv lies the interval of a tritone, which as we have already noted is the interval associated with Kundry. Yet the motive is frequently heard in association with Klingsor so perhaps it is more about magic (with Kundry trapped in Klingsor's spell) than it is about either of these characters.